The Company, Insar Sdn Bhd started its business on 05 March 1988. 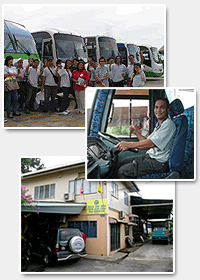 The Major activity is to provide passengers transportation services in Sarawak, mainly in Kuching area. Meanwhile we also provide vehicles rental services within Sarawak. The Company is currently operating in 524 Jalan Angsana Off Pisang Road West, 93150 Kuching, Sarawak. Currently we own about 30 units of big, medium & small buses. Insar means "Inside Sarawak". We bring visitors to Sarawak to discover the adventures, and mystic beauty she posses. Formed in 1988, we (Insar Travel & Tours Sdn Bhd) are one of the largest and most dependable and reliable tour operators within Sarawak. Since our humble beginning, Insar's dedicated team has always ensured quality service to its guests from around the world. Today, we have built up a fleet of luxury and modern coaches and along with our dedicated staff, we ensure every comfort and safety is provided to our travelers throughout the stay. We are flexible in organizing tour itineraries to suit your preference. Insar firmly believes that the most important element for a Sarawak trip is to enjoy your holiday with the least amount of worries and have wonderful memories and a great experience. We are committed to achieve "CARS" for our customers, that are bringing passengers in a Comfort, Affordable, Reliable & Safety way. Copyright of Insar Sdn Bhd 2010. All Rights Reserved.